I spoke with Goodman last month, shortly after his new backcountry ski guide, Best Backcountry Skiing in the Northeast, reached stores. As it turns out, the new book updates his decade-ago wish for his daughter. It also gives hope and advice to the rest of us who are backcountry skiers and parents hoping to share something we love with our young children. To write his first guidebook, Classic Backcountry Skiing, published in 1989, Goodman completed his research in one glorious ski season. Now married, the father of two children, and a fulltime writer, Goodman confessed, “My life does not accommodate living out of my car and skiing every day.” He took three years to research the current book. Along the way, he created a special tradition with daughter Ariel. Ariel grew up skiing with her parents and brother Jasper, who is younger by eight years. (See Goodman’s advice for raising kids on skis.) But she didn’t join her mother and father on backcountry trips, preferring the ease of downhill skiing at ski resorts. That changed the year Ariel turned 14, when her father took her downhill skiing in Utah for a week with another dad and daughter during their February school vacation – a trip they repeated the following year. Goodman highly recommends inviting a child’s friends on ski trips. “Teenagers don’t need face time with you,” he said. 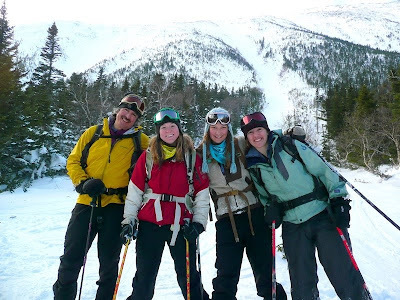 “But they’re definitely up for doing fun stuff with their friends.” On their first backcountry trip, the three girls and Goodman spent the night in Joe Dodge Lodge at Pinkham Notch. The next day, they skinned up to ski the Avalanche Brook Trail to Jackson. The girls asked a lot of questions on that first trip, including the classic, Are we there yet? on the long uphill. But when they started singing songs, they stopped noticing the uphill. Once they’d peeled the skins from their skis, another question came up: How do we do that telemark turn? Goodman told them, “You know how to ski. Just go ski.” To me, he explained, “Modern backcountry gear is a lot like alpine gear. The important thing was that they felt confident getting down, that they didn’t worry about knowing the secret backcountry skiing password.” And down they went — giggling the whole way. This past winter, during Ariel’s final year of high school, she and several friends again joined her father on what has become an annual winter tradition. Once again they stayed at Pinkham. The girls made their bunkroom into a fort and joined in the family dining with gusto. During the day, they broke trail and skied slopes groomed only by nature. As Goodman knows, the adventure and the memories aren’t limited to the skiing. I’ll share Goodman’s list of teen-approved backcountry ski tours in my next post. … Check out tips on teaching cross-country skiing to children. Photo: David Goodman, on the left, and Ariel Goodman, on the right, joined by Caroline Dillon and Jessica Normandeau in the Gulf of Slides, Mt. Washington. Photo courtesy David Goodman.